This is for me a dream combination of highly individual musicians and dear friends who I have known for many years. To be on the road with them all will be a joy, not only because we all feel the music in much the same way but also because I’m sure I will die laughing, which is not a bad way to go. We’re not heavy metal and we’re not hipping and hopping but we do know the roots of rock’roll and the real R & B. We all love the New Orleans funk feel and our rhythm is not so much slammin’ as strokin’ if you get my drift. I think this band could play any style in our own way and we will do so on our show. 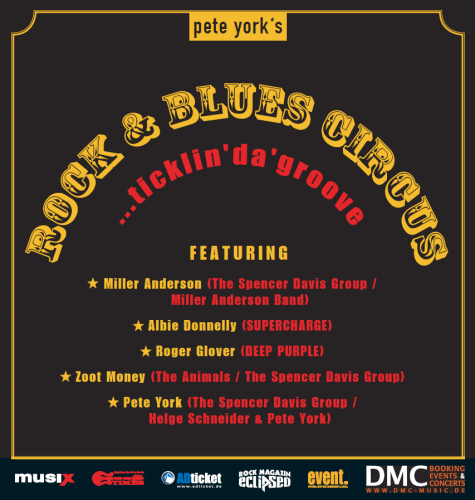 And if you want to know what Ticklin’ Da Groove is all about, come along and let us Tickle Your Groove. You’ll love it. Thanks to Yvonne and to Lutz Reinert for the info. Posted by Nick Soveiko on Monday, March 19th, 2018, filed under News. You can follow comment on this post through the RSS 2.0 feed. You can skip to the end and leave a comment. Pinging is currently not allowed. But is he going to pack his trunk and go with a trumpety trump? The only thing missing is the Spencer Davis Group!. Saw them in `82 with Jon Lord. Met him after the show for a few minutes. There was no pen to find to sign anything. What a shame. There has been also Colin Hodkinson. Shortly after that he joined Whitesnake. Pete York was one of the “old Boys” for me. It´s 35 years gone. Had the opportunity to talk to Pete York in the late 80s, me being a young writer for a city mag … he took the time to chat for hours and kept bringing me beer … whereas other so called stars at the time didn’t bother to show up for the interview as planned. Pete said he was there way before they were there and he would still be there long after them too … so this is prove he was true! A great night indeed with lots of stories being told and lots of fun had by all. Albie Donnelly played in Stuttgart last december and I happened to meet him in the bathroom before the show …nice to meet you, sir, I said and made him laugh. Great show afterwards and so much fun! I’ll be there to see them in december! Sounds great, hope they record some shows. Wish they’d put some dates together in the UK.